This revolutionary scooper allows for pick up of animal waste single-handedly. Made of durable plastic with a wide handle for a comfortable grip. 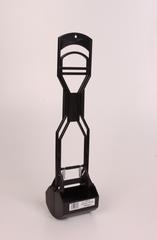 This model made for flat surfaces such as sidewalks and streets. This revolutionary scooper allows for pick up of animal waste single-handedly. 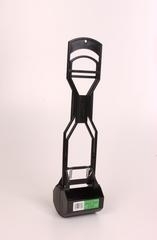 Made of durable plastic with a wide handle for a comfortable grip. This model made for grassy areas. Designed for quick pick up of animal waste in tall grassy areas. Firm and durable in its use for moving garden soil and animal debris. A sturdy seven inch scoop, one scoop solid, the other a rake. Great for picking up animal waste around the yard. 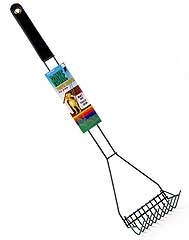 These rake sets are extremely durable and made with a stainless steel collection base that won't rust. 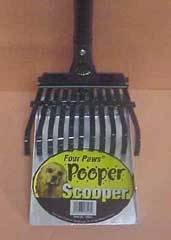 Plain Sanitary Pooper Scooper. For use in the removal of animal waste around garden, yards and streets. Two wrap around scoops made of aluminum to resist rust. Treated wooden handles with hang up loop. 32 inch high. Designed for easy pet clean-ups in grassy or sandy areas. The perfectly spaced metal prongs allow quick and easy passage through grass or sand. 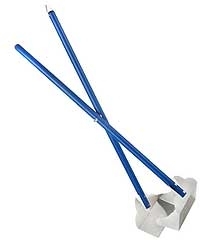 This scooper features a rubber handle to facilitate ease of use and comfort.